We have one more month of the season after Pentecost, Ordinary Time, the green season. When it began in spring, everything seemed to have sprung from the earth —greener than ever before. I was traveling between New York City and Nashville then, dealing with death but also life: the recent passing of my mother and the marriage of my daughter and, as usual for all of us at times, the trials of friends and loved ones, of sickness, sorrow, and struggles, those details of ordinary life that don’t always feel very ordinary. A friend asked me if Ordinary Time —the part of the church year after Epiphany and post-Pentecost—means “no holidays” (the answer: “sort of, but not exactly”). “Holidays” is a word that changes back easily to its root, holy days, more liturgically accurate. Ordinary Time is a term that comes from the Latin ordinalis —numbers in a series —and ordo, which gives us the word “order.” These numbered weeks of Ordinary Time are an ordering as we live our lives with little liturgical feasting or fasting, but openly and fully feeling and maturing into the life of Christ, in watchful expectation of his coming again. Calling the season Ordinary Time does sound so ordinary: nothing special, no big deal. As for the season’s liturgical color, it’s green, like the outside world; our vestments, and the altar frontal, evoke for me “The Liturgical Color Song” from the Catechesis of the Good Shepherd, which reminds the children that amidst those seasonal colors —purple, red, white —there is green, for the growing time. Flying above the earth in June, I saw areas of such dense leafiness one couldn’t distinguish the individual parts of the landscape; the green formed an enticing expanse, a welcoming lushness, absolute verdance like an oasis offering us hope, a reminder that, despite the loss of a loved one or suffering that seems beyond help, the life force exists in nature, originating from our Creator. In my Sunday school classroom, I had mustard seeds in a glass bottle for the kids to plant. They marveled at the tininess, and weeks later they marveled at the growth, the green, they’d helped bring into being. They could tell anyone who saw the plants: the mustard seed germinates, develops, grows, once started, in any season. Even in ordinary time —literal and figurative —in community and individually, we can grow our faith, grow in our faith. We are asked to decide, from the examples of the mustard seed, of all Jesus’ teachings, what we’ll do with our belief, by examining what Jesus means, taking it to heart, then following through, putting that meaning into action, going beyond what we assume we already know about faithfulness (and how it starts small but can become infinite) and how to share it. Are we the sower or the gardener or the plant? Or all? That parable of the seed is often cited for how profound faith can come from what seems the smallest thing. The process of growing this way is quiet and noisy, internal and external, with God as its essence. We can be in it ourselves, and also with others. Think of seeds creaking and cracking beneath the earth, of sprouts stretching and reaching, breaking through, as God breaks through to each of us, and is in us, and of how we break through ourselves, out to each other. There will be new seeds. We can plant them and spread them. We can nurture and nourish what grows, nurture and nourish each other. Jesus tells us, that must be done —emblematic of possibility, the ongoing kingdom, on earth as in heaven. This process of growing in and with God is constant in the readings throughout this time that ends on the last Sunday of Pentecost, Christ the King. By our faith, we reap the harvest, as green gives way to other colors, though it always returns, renews. The Reverend Deacon Rebecca Weiner Tompkins is a professor, a musician, and a poet. A book of her poems, King of the Fireflies, will be published in November by Sensitive Skin Books. A selection of Rebecca’s poems may be read at the Sensitive Skin Magazine website. YOUR PRAYERS ARE ASKED FOR Martin, Jay, Mickie, Hugh, Nadira, Peter, Eloise, Michael, Jorem, Donald, Irma, Al, Flor, Greg, Alexandra, James, Karen, Carlos, Susan, Marilouise, Timothy, Barbara, Dennis, Robert, Abraham, Randy, Burton, May, Heidi, Takeem, David, and Sandy; and Horace, Gaylord, Louis, and Edgar, priests; and all the benefactors and friends of this parish. GRANT THEM PEACE . . . October 28: 1871 Thomas Williams; 1884 Martha Elizabeth America; 1923 John Collins; 1958 Annette Bertha Dourdan. IN THIS TRANSITORY LIFE . . . The Contemplative Outreach community issued the following announcement on Friday morning, “It is with deep sorrow that we share the news of the passing of our beloved teacher and spiritual father, Thomas Keating. Fr. Thomas offered his final letting go of the body on October 25, 2018 at 10:07 PM at Saint Joseph’s Abbey in Spencer, Massachusetts. He modeled for us the incredible riches and humility borne of a divine relationship that is not only possible but is already the fact in every human being. Such was his teaching, such was his life. He now shines his light from the heights and the depths of the heart of the Trinity.” Thomas Keating, OCSO, was born in New York City on March 7, 1923. He attended Deerfield Academy, Yale University, and Fordham University. He entered the Order of the Cistercians of the Strict Observance, commonly known as the Trappists, in Valley Falls, Rhode Island, in January, 1944. He was one of the founders of the Centering Prayer movement and of Contemplative Outreach, Ltd., an international, ecumenical spiritual network. The Centering Prayer Group here at Saint Mary’s continues to study Fr. Keating’s work. If you would like to know more about Fr. Keating, his life, his influence, his writings, and his teachings, you may speak to one of the leaders of our Centering Prayer Group, Blair Burroughs, Renée Pecquex, or Ingrid Sletten. Please pray for Fr. Keating, his Trappist brothers, his family, his worldwide community, and all who mourn in your prayers. ALL SAINTS’ DAY, ALL SOULS’ DAY & PARISH REQUIEMS . . . At Saint Mary’s, the celebration of all of our “principal feasts” begins on their eve. So it is that we will begin our celebration of All Saints’ Day this year on All Hallows Eve, Wednesday, October 31, with Solemn Evensong at 6:00 PM. A quartet of singers from the parish choir will assist the congregation. They will sing the canticles —Short Service in F by John Blow (1649–1708) —and a motet composed by Dr. Hurd. On Thursday, November 1, Morning Prayer will be sung at 8:30 AM, the Noonday Office will be prayed at 12:00 PM; a Sung Mass follows at 12:10 PM. Paul-Martin Maki will play the organ recital at 5:30 PM. I am delighted that the Bishop of New York, the Right Reverend Andrew M. L. Dietsche, will be with us as celebrant and preacher for the Solemn Mass at 6:00 PM. Holy Baptism and Reaffirmation of baptismal vows will be celebrated at this Mass. The music will include Missa O quam gloriosum by Tomás Luis de Victoria (1548–1611) and an introit and a motet composed by Dr. Hurd. A reception will follow in Saint Joseph’s Hall. 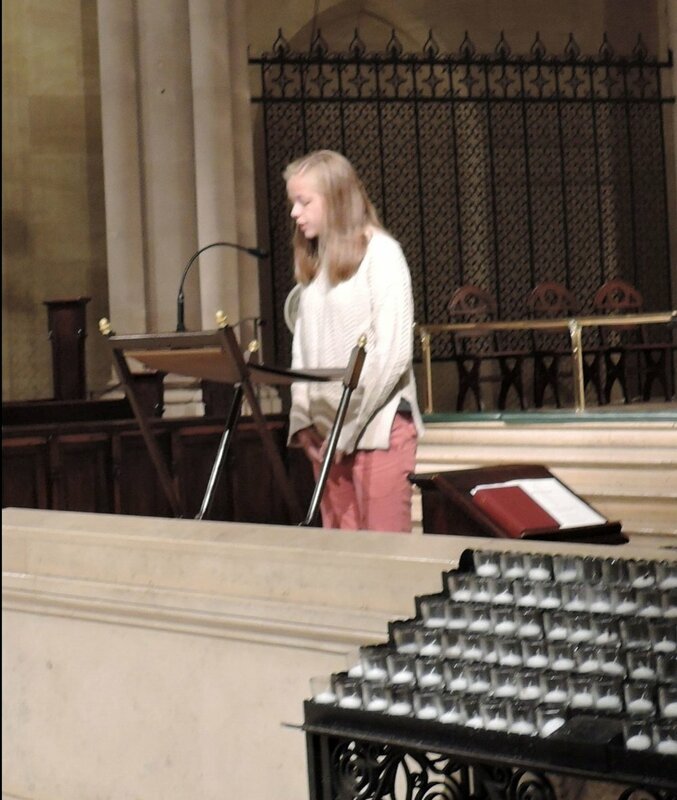 Agnes Heffner read the Scriptures on Sunday. THIS WEEK AT SAINT MARY’S . . . The Art Meditation scheduled for the afternoon of Sunday, October 28 has been cancelled . . . Sunday, October 28, The Twenty-third Sunday after Pentecost: Sung Matins 8:30 AM, Mass 9:00 AM, Adult Forum 10:00 AM, Mass 10:00 AM, Solemn Mass 11:00 AM, Solemn Evensong & Benediction 5:00 PM . . . Monday, October 29, Saint Simon and Saint Jude, Apostles (transferred), Morning Prayer 8:30 AM, Noonday Prayer 12:00 PM, Mass 12:10 PM, Evening Prayer 6:00 PM, Mass 6:20 PM . . . Wednesday, October 31, 6:00 PM, Eve of All Saints’ Day, Solemn Evensong 6:00 PM . . . The Wednesday Night Bible Study Class will not meet on the Eve of All Saints’ Day, October 31 . . . Thursday, November 1, All Saints’ Day (see above) . . . Friday, November 2, All Souls’ Day (see above) . . . The Centering Prayer Group will not meet on Friday, November 2 . . . Saturday, November 3, Requiem Mass (A–E) 12:10 PM, Evening Prayer 5:00 PM, Vigil Mass for Sunday 5:20 PM. CHRISTIAN EDUCATION . . . Brother Damien, SSF, and Brother Thomas, SSF, conclude their four-part series on Franciscan life, theology, and spirituality on Sunday, October 28, when the topic of the day will be “Franciscans at Saint Mary’s: Envisioning Our Life Together.” Coming up: on Sundays in November, Father Peter Powell will lead the class in a discussion of the Elijah/Elisha cycle in 1 Kings 16:23–2 Kings 13:25. Father Powell writes, “The Elijah/Elisha cycle in 1 and 2 Kings are interesting stories as literature. But of course we don’t read the Bible just as literature. We read it to discover how God works in our world. Elijah and Elisha prophesied to Israel when it was ruled by Israelite kings. Their relationship to the kings of Israel has much to teach us about how the religious community relates to power. The Kings despised Elijah and Elisha for the way they spoke truth to power. They saw the demands of God to be in conflict to the accumulation of power. Perhaps there is a message for the 21st century here?” . . . Sunday, December 2 and 9, parishioner and resident iconographer, Zachary Roesemann, will talk about Advent and Incarnation in light of a recent project he’s been working on in his Mission House studio . . . The Adult Forum meets on Sundays at 10:00 AM in Saint Benedict’s Study, 145 West Forty-sixth Street . . . The Wednesday Night Bible Study Class meets next on November 7 at 7:00 PM, following the evening Requiem Mass. (The class will not meet on October 31.) At the next class, we will begin reading at James 1:17. Please note the later start time. The class is reading the Letter of James and is led by Father Jay Smith. The classes on Sunday morning and on Wednesday evenings meet in Saint Benedict’s Study. AROUND THE PARISH . . . Dr. David Hurd, organist and music director, will play a recital at Marble Collegiate Church on Monday, October 29, 12:30–1:00 PM, as part of that church’s “Monday Soul Break Concert Series.” Marble Collegiate is located on Fifth Avenue at Twenty-ninth Street . . . We mailed packets for this year’s Stewardship Campaign at the end of this week. (We are grateful to Rick Austill, Brendon Hunter, Grace Mudd, and Marie Rosseels, who volunteered their time to get the mailing done, and to office manager, Chris Howatt, who added postage and got the packets out the door at last.) We invite you prayerfully to consider making, or increasing, your pledge for the coming year. Our needs are great. Our mission is clear. We welcome your support . . . We still hope to receive donations for altar flowers on the following dates: December 7, the Eve of the Conception of the Blessed Virgin Mary, and on all Sundays in January, including the Epiphany on Sunday, January 6. If you would like to make a donation, please contact the parish office . . . The Rector will be on vacation from Thursday, October 18. He returns to the parish office on Wednesday, October 31 . . . Attendance last Sunday: 189. FROM THE MUSIC DIRECTOR . . . The setting of the Mass on Sunday morning is by Felix Mendelssohn (1809–1847). Mendelssohn blossomed early as a conductor, composer, and pianist. His initial music studies in Berlin were followed by travel in England, Scotland, Italy, and France before his appointment in 1833 as music director in Düsseldorf. Two years later he became conductor of the Gewandhaus concerts in Leipzig where, together with Schumann and others, he founded the Leipzig Conservatorium in 1842. His 1829 Leipzig performance of Bach’s Saint Matthew Passion helped decisively to stimulate the nineteenth-century rediscovery of the music of J. S. Bach (1685–1750). His contributions as a composer span the categories of orchestral, choral, stage, chamber, piano, vocal, and organ works. His music is said to have set the canons of mid-Victorian musical taste. Mendelssohn’s Die Deutsche Liturgie (1846) for eight-voice double choir includes Kyrie (not sung this morning), Gloria (Ehre sei Gott), and his previously composed Sanctus (Heilig, 1844). Agnus Dei (Lamm Gottes) is an adaptation of Mendelssohn’s eight-voice motet In der Passionszeit (Herr, gedenke nicht), from Sechs Sprüche, Op 57/4, 1844). It is sung today as adapted by James Kennerley. Sunday’s Communion motet is another eight-voice setting from Mendelssohn’s Sechs Sprüche, Opus 57/2, the text of which is drawn from Psalm 90. In Mendelssohn’s six-movement liturgical cycle, this motet was designated for use on New Year’s Day, carrying the title Am Neujahrstage. Two Saint Mary's parishioners have a serious discussion about footwear at the Drop-in Day. OUTREACH AT SAINT MARY’S . . . Donations and volunteers are needed for our next Drop-in Day on Wednesday, November 28, and for the many requests for assistance between Drop-in Days. We are in particular need of basic items such as the following: packs of new underwear in various sizes for both men and women; slacks for both men and women, including jeans, chinos, khakis, etc. ; packs of new socks, white and black; rainwear; knapsacks; and toiletry articles. Please contact Father Jay Smith if you would like to volunteer for this important ministry or if you would like to make a donation . . . We continue to receive nonperishable food items for our outreach partner, Saint Clement’s Food Pantry. Please place those items in the basket near the ushers’ table at the Forty-sixth Street entrance to the church. We are very grateful to all those who continue to support this ministry. NEWS FROM OUR DROP-IN DAY . . . On Wednesday, October 24, we hosted our monthly Drop-in Day. We served seventy-two guests, distributing essential items such as underwear, socks, blankets, and toiletries. Summer has come to an end here in New York, and so we also had requests for sweatshirts, jackets, and coats. Chris Portelli, co-director of Project FAIR and a coordinating attorney at New York Legal Assistance Group (NYLAG), was here with his group of six attorneys and law students to provide legal advice. The NYLAG volunteers also helped our guests to find clothing and toiletries, assisting our hard-working, experienced, and dedicated group of Saint Mary’s volunteers. Brother Damien, SSF, and Brother Thomas, SSF, provided calm and able leadership, as they continue acquainting themselves with our guests, our corps of volunteers, and the structure of this ministry. We continue to be grateful to Sister Monica Clare, CSJB, whose leadership helped give us that structure, which has kept us going during this time of change. THE VISUAL ARTS AT SAINT MARY’S . . . An art exhibit entitled “Spirit’s Flight” continues on view in the Gallery in Saint Joseph’s Hall. This exhibition features the work of two artists, Deborah Holcombe and Ingrid Sletten. Ingrid and Deborah’s work, in different ways, explores the intersection between nature and the spirit. They have subtitled the exhibition “More Than the Eyes See: Combining Science with Revelation.” The closing reception for the exhibition, entitled “Visio Divina,” will take place on Friday, November 9, 6:00–8:00 PM. For more information about the event and to RSVP, you may visit the Eventbrite website. Ingrid is a parishioner here and it has been a particular joy to be able to show her work. We are grateful to her for introducing us to that work and to the work of her friend and colleague, Deborah Holcombe. CONCERTS AT SAINT MARY’S . . . Saturday, November 10, 2018, 8:00 PM, Miller Theatre Early Music Series, Cappella Pratensis: “The Josquin Imitation Game.” Music by Josquin des Prez and Ockeghem, Van Ghizeghem, Busnoys, Willaert, and Gombert. From the theater website, “Josquin des Prez paid homage to his predecessors through the use of imitation. By the same token, subsequent composers played this game as a deliberate tribute, utilizing the same texts, melodies, and other characteristics of his music. The acclaimed Cappella Pratensis, known for their period interpretations, makes their Miller debut with a program anchored by Josquin masterpieces and exploring some of the great polyphonic works of the period by composers who inspired Josquin and those who were later inspired by him . . . Tuesday, November 13, 7:30 PM, Lincoln Center’s White Lights Festival: The Distant Light, Latvian Radio Choir. LOOKING AHEAD . . . Sunday, November 4, 2018, Daylight Saving Time Ends . . . Friday, November 9 and Saturday, November 10, 2018, Diocesan Convention at the Crowne Plaza, White Plains–Downtown . . . Wednesday, November 21, Eve of Thanksgiving Day, Sung Mass 6:00 PM . . . Thursday, November 22, Thanksgiving Day, Noonday Prayer 12:00 PM, Sung Mass 12:10 PM . . . Sunday, November 25, Last Sunday after Pentecost and Commitment Sunday . . . Sunday, December 2, First Sunday of Advent. AT THE GALLERIES . . . At the Museum of Modern Art, Fifty-third Street between Fifth and Sixth Avenues, until January 13, 2019, Charles White: A Retrospective. From the museum website, “Art must be an integral part of the struggle,” Charles White insisted. “It can’t simply mirror what’s taking place. … It must ally itself with the forces of liberation.” Over the course of his four-decade career, White’s commitment to creating powerful images of African Americans —what his gallerist and, later, White himself described as “images of dignity” —was unwavering. Using his virtuoso skills as a draftsman, printmaker, and painter, White developed his style and approach over time to address shifting concerns and new audiences. In each of the cities in which he lived over the course of his career —Chicago, New York, and, finally, Los Angeles —White became a key figure within a vibrant community of creative artists, writers, and activists. Charles White: A Retrospective is the first major museum survey devoted to the artist in over thirty years. The exhibition charts White’s full career —from the 1930s through his premature death in 1979 —with over 100 works, including drawings, paintings, prints, photographs, illustrated books, record covers and archival material. Chris Portelli (seated at center) and volunteers from the New York Legal Assistance Group provided much assistance at the Drop-in Day on Wednesday.